As the fifth season premiere of The Walking Dead approaches on October 12, it’s a good time to take stock of the impact this show has had since it premiered on Halloween of 2010. I was watching that night, as I’ve watched each episode since, and as a longtime reader of the comics, I had been following the show’s development for a year before it ever premiered. But never in my wildest dreams would I have ever predicted that an hourlong zombie drama would become the number one show on cable, in terms of ratings. It still seems almost too geeky to be possible. Moreover, in 2014 we’re already taking for granted how much this show has changed cable in terms of its ceiling for violence, gore and disturbing imagery. Put simply, it’s the most graphically violent show that’s ever aired on basic cable, and that violence has paved the way for other horror-centric, graphic shows such as American Horror Story to further push the boundaries of good taste and what one can reasonably get away with airing in primetime. In honor of its upcoming fifth season then, here’s a collection of the 10 grossest and goriest moments in the first four seasons of The Walking Dead. It should go without saying, but there are plenty of spoilers below. The so-called “Bicycle Girl” is perhaps the show’s most iconic single zombie, which was the whole idea. 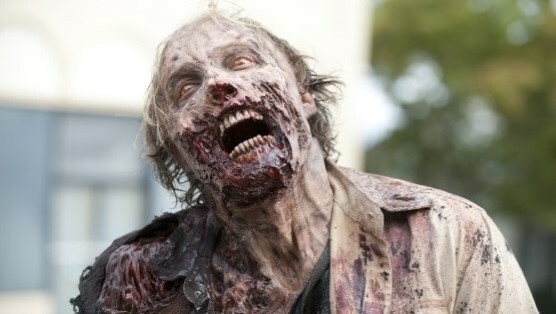 One of the most visually arresting images from the show’s landmark pilot episode in Season One, this zombie was essentially The Walking Dead’s statement of intentions: “We are going to be gross. We are going to push the boundaries of what you can show on TV. Get on board, or get out.” There aren’t a lot of zombies in the history of the show who have had their full backstories explained, but Bicycle Girl got her story told via a series of AMC-produced webisodes, revealing just how she ended up a crawling, desiccated torso. Dale was the dedicated conscience of the Grimes Gang, the one member of the original Atlanta group who was fully committed to never losing his humanity, which means that—without him—things quickly began to spiral into the barbaric. But it’s the manner in which he died that rubbed in what a cruel world these characters were now living in. He fought as hard as he could against that zombie, but in the end his struggle was a metaphor for trying to fight death itself in this world. The zombie ultimately dispatches him in such an effortless way—it just digs its fingers into his gut and peels him open like a freaking bag of potato chips. We’ve seen a lot of people killed by zombies on this show, but Dale’s death shows just how pathetically easy it is. In the fourth season premiere, “30 Days Without an Accident,” members of our survivor group scavenge their way through a local grocery store called Big Spot in part of the never-ending quest to find supplies. Unfortunately, plenty of zombies are on the roof, and they begin to crash through, raining down on the survivors. There are a few particularly gross bits in this sequence, especially the walker with the split-open head and the one hanging from the ceiling by its own guts. But the worst imagery occurs in a top-down shot from the roof. We see a crawling walker drag itself over the edge and plunge straight down to the floor, where it hits the ground and pretty much liquefies, being so decomposed that the force of its impact just smooshes its head completely. It’s one of the goriest moments in the entire show, like something from an early Peter Jackson movie. Bitten by a walker? That’s bad news for you. Stabbed in the neck by a shiv made from a walker arm bone? Well, you’re pretty much screwed. This is just adding insult to injury—when Maggie and Glenn make their escape from Woodbury in Season Three, they don’t tiptoe around confrontation. Of all the terrible ways to go in this show, being stabbed by a zombie bone is pretty high up there. Even if you somehow survived the initial wound, you’re just going to catch the zombie virus and end up dead anyway. A sharpened walker bone is, like, the most deadly weapon that exists in this universe. These characters spend most of their time trying to AVOID being draped in human remains, if at all possible. But in Season One they quickly learned that it was something they were going to have to get used to in the zombie apocalypse. After realizing that smelling like a walker can offer fairly effective camouflage (as long as it doesn’t start raining), Rick and Glenn do what needs to be done in order to get through a big herd of walkers, covering themselves from head to toe in squelchy zombie guts. I especially love the lengths of intestine thrown over their shoulders like a festive scarf of gore.